Hula for the Royal Order of Kamehameha, 1919. HE HULA NO KA HUI KAMEHAMEHA. Prince Jonah Kuhio Kalanianaole and the Ahahui Kamehameha, 1922. THE HEAVENLY ONE, CHIEF JONAH KUHIO KALANIANAOLE AND THE AHAHUI KAMEHAMEHA. With the departing of this life by the Heavenly One, Alii Jonah Kuhio Kalanianaole as his spirit glided off to the world of eternal rest, he left behind monuments for the Hawaiian lahui to remember for many years to come. During his lifetime, over the many years gone by, his good and upright character was always seen through the works that he carried out for the good of all. It is something familiar to all that knew him. 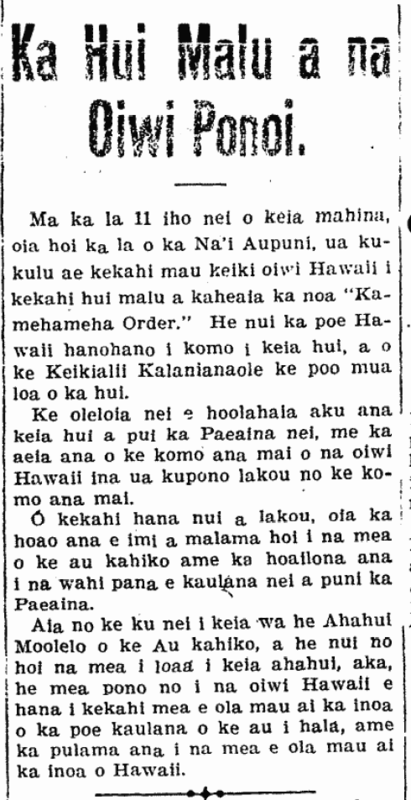 Kalanianaole and the Ahahui Kamehameha, 1922. 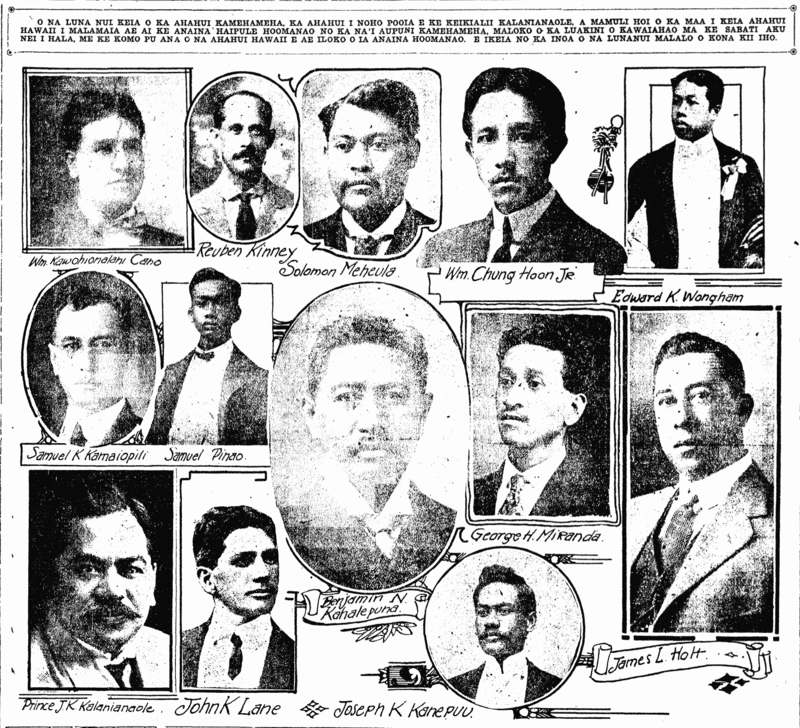 Collage of Royal Order of Kamehameha officers, 1918. THESE ARE THE OFFICERS OF THE AHAHUI KAMEHAMEHA, THE ORGANIZATION HEADED BY PRINCE KALANIANAOLE, AND AS USUAL THIS HAWAIIAN ORGANIZATION HELD A PRAYER SERVICE OF REMEMBRANCE FOR KA NA’I AUPUNI KAMEHAMEHA IN KAWAIAHAO CHURCH THIS PAST SUNDAY, WITH OTHER HAWAIIAN GROUPS IN ATTENDANCE AT THAT GATHERING OF COMMEMORATION. THE NAMES OF THE OFFICERS ARE SEEN BELOW THEIR PICTURES. William Kawohionalani Cano, Reuben Kinney, Solomon Meheula, William Chung Hoon, Jr., Edward K. Wongham. Samuel K. Kamaiopili, Samuel Pinao, Benjamin N. Kahalepuna, George H. Miranda, James L. Holt. Prince J. K. Kalanianaole, John K. Lane, Joseph K. Kanepuu. Ka Nupepa Kuokoa, Buke LVI, Helu 24, Aoao 1. Iune 14, 1918.